I'm on a bit of a Fighting Fantasy kick at the moment. 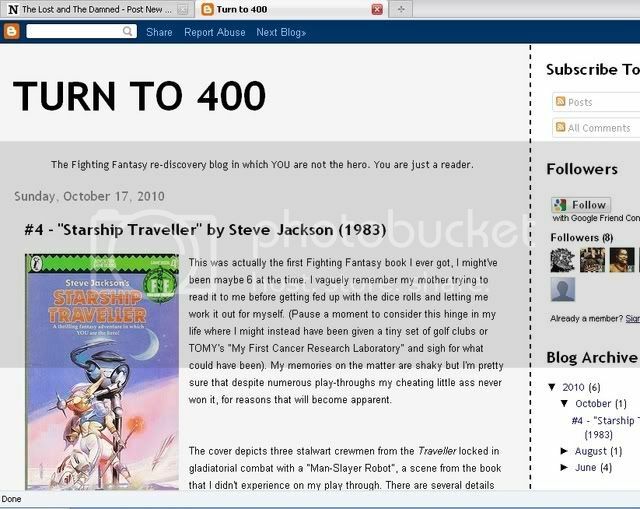 Turn to 400 http://turnto400.blogspot.com/ deserves a special mention. There's currently only a handful of entries (don't forget to click "older posts")- devoted to early Fighting Fantasy gamebooks, but they've had me giggling all over the place. Wonderfully inciteful and at times rather puerile , it definitely talks to the younger gamer in all of us. Firetop Mountain is kind of a weird environment. The area near the entrance is populated with ORCS and GOBLINS who are all either asleep or getting drunk. This is fairly typical of the media's negative stereotyping of such creatures. The orcs/goblins live in unadorned rooms that usually contain a straw pallet, a small box with mysterious contents, and nothing else (well, maybe a table in some cases). Passing through, you do not get the sense that they have many amenities, they have been poorly provided for and have little to do. Many are fairly clearly depressed (at least up until the moment that you murder them). For reasons clearly explained, Murray is also obsessed with the number of skeletons there are in the Fighting Fantasy books, and insists on counting them. Each book review is followed by a "Skeleton Report". Why no-one else does this, I have no idea. The author of the Turn to 400 blog is clearly god amongst men, or is perhaps just a little unwell. Either way blog-voyeurism here is compulsory. Follow Turn to 400 if you can! Mr Babble posted a link to this on Facebook yesterday and it served as a great distraction from writing about the new citadel tower kits. 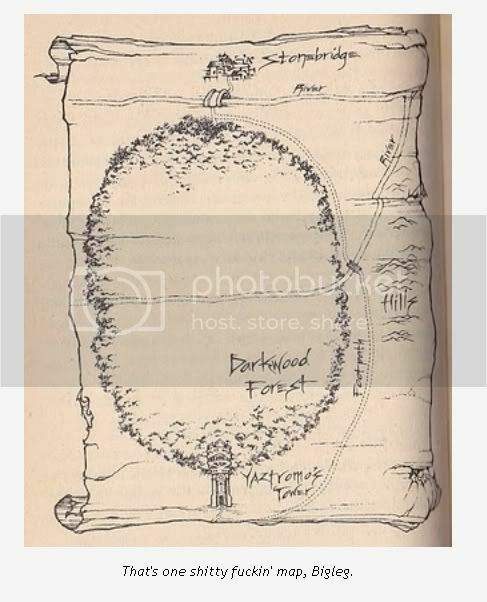 I've been a fan of FF books for as long as I can remember and this Blog is a great insight into another persons experience of playing the books. At first an after action report on a solo-game book sounds like an absurd idea, but this blog pull it off in an interesting and witty style and it's always nice to be able to compare your experience of a particular adventure to someone else's. I'll let him know we're posting about him, it's only fair. Unless he's got one of those clever ping-back systems which reverse-links back to the forum, or something. The interweb is propelled by strange magicks! I'll see if I have an account with that service I can use to make the post ... the forum must be plugged! I'm looking forward to giving Return to Firetop Mountain a proper try soon. Good luck! I'll add it to the FF Links thread. any word back from this guy yet? The Deathtrap Dungeon entry was funny. I had to resist posting my own way of beating it last year, where I add to resort to writing every number and choices down - which is too much like "metagaming" for me, where you're trying to beat the book so to speak, as opposed to making logical (or heroic) in-game decisions. He's just posted about Scorpion Swamp - only had a quick look at the pictures so far.